It means that in the nearest weeks LIZDA regional organization will decide on support to strike, the possible format and time. The next LIZDA council meeting will be held on April 17. The initial idea is to hold the strike in September, but decisions are yet to be made. LIZDA chairwoman Inga Vanaga said at the council meeting that was also attended by Education and Science Minister Ilga Suplinska (New Conservative Party (JKP), that the plan proposed by the ruling coalition did not convince the trade union that the necessary financing for teachers’ wages will be found by September. “We want to help the Education adn Science Ministry,” said Vanaga, adding that the trade union also wants to feel that Suplinska is on the side of teachers. Suplinska underscored that she and the ministry does not have the money. The government and the Saeima should be given a signal that the system is being reformed. 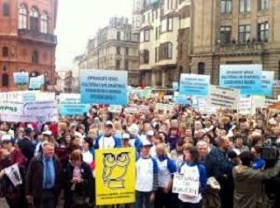 The minister criticized the trade union for unwillingness to participate in reforms and doing the “home task”. After the minister left the meeting, Vanaga told the press that the minister’s position makes cooperation with her difficult. As reported, the ruling coalition parties have decided to propose a deal to teachers – include in the budget bills a possibility to raise teachers’ wages if the necessary funding is found and the necessary reforms are carried out, said Prime Minister Krisjanis Karins (New Unity) said earlier. The latest coalition’s proposal provides that money could be found by mid-May, amending the 2019 budget to ensure the promised pay rise as of September. EUR 1.7 mln out of EUR 9 mln necessary for increasing teachers' salaries had been found, and the remaining financing would be looked for through cooperation between teachers' union and the government. Suplinska said earlier that the two sides today agreed on cooperation in drafting amendments to the 2019 state budget when the budget would be reviewed in the second reading. The amendments will state that the government resolves to increase teachers' salaries - on several conditions, including continuing optimization of school network.